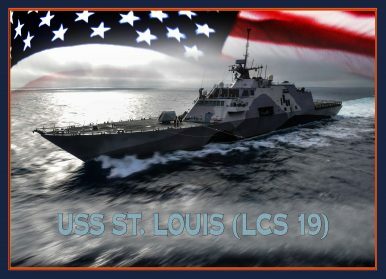 The U.S. Navy christened its latest littoral combat ship (LCS), the future USS St. Louis (LCS 19), during a ceremony at the Fincantieri Marinette Marine shipyard in Wisconsin on December 15, the service said in a statement. The future USS St. Louis is the tenth of the Freedom-class variant and the 24rd LCS overall. The ship, laid down in May 2017, is slated for commissioning in early 2020. LCSs are divided into two separate variants, the trimaran-hull Independence and mono-hull Freedom classes. Ships of the Freedom-class variant are being constructed by a Lockheed Martin team at Marinette in Wisconsin, while production of Independence-class LCSs is led by Austal USA in Alabama. As I explained previously, with 40 percent of the hull easily reconfigurable, both LCS classes use an open architecture design, which enables the ships to be fitted with interchangeable so-called mission packages providing capabilities for surface warfare (SUW), anti-submarine warfare (ASW), and mine countermeasures (MCM) missions in the littoral zone. Survivability testing and preliminary analyses on both LCS variants continue to demonstrate that neither LCS variant is survivable in high intensity combat. Although the ships incorporate capabilities to reduce their susceptibility to attack, testing of analogous capabilities in other ship classes demonstrated that such capabilities have limited effectiveness in high intensity combat. Lockheed Martin kicked off construction of two new Freedom-class LCS in 2018. It also delivered two LCS to the U.S. Navy and successfully completed sea and builder trials of three ships of the class. One Freedom-class variant, the USS Sioux City (LCS-11), was commissioned in November 2018, bringing the total number of warships of the class to six. There are an additional seven LCS in various stages of construction at the Marinette shipyard. The future USS Wichita, the first East Coast Mine Warfare Division ship, will be commissioned in Mayport Florida on January 12. Two Independence-class LCSs, LCS 36 and LCS 38, were awarded to Austal USA in December. Lockheed Martin was awarded a contract modification for the construction of LCS 29 in September. Two additional ships, LCSs 32 and 34— the 16th and 17th Independence variants — were awarded to Austal USA in September. The Austal and Lockheed shipyards are optimized to build two LCS per year.